Ayoade directs The Double as surreal as humanly possible. It is like a Kubrick film meets an episode of Louie. Simon works at a government agency that exists somewhere in either the distant past or the distant future. While all of the technology is outdated, the general vibe is that of an Orwellian future. Simon is nothing but a victim in this world where the suicide rate is high, probably because humans are so out of touch with each other that staring from a distance is an appropriate form of affection. Not surprisingly, given this unforgiving world and the fact that this character is played by Jesse Eisenberg, Simon has trouble finding a lady. Yet, he is in love with Hannah (Mia Wasikowska), the girl across the courtyard. He mainly resorts to observing her through a telescope. She is like a Manic Pixie Dream Girl to the audience but in reality, she is far from that. Hannah is a mangled, broken marionette who is controlled by people she doesn’t want to be. Hannah doesn’t teach Simon to live life to the fullest, but they can both bond over feeling like Pinocchio. We never get a chance to see Simon living a normal, happy life. In fact, the closest he ever gets to happiness is when Hannah is within eyesight. But his life gets just a little bit worse when James (Jesse Eisenberg) shows up. James is Simon’s double, and he is a lot more confident and charismatic than Simon is. At first, Simon thinks he can trust his doppleganger, because how could you not trust somebody who looks exactly like you? Simon learns that you probably shouldn’t trust your doppleganger, especially if they are really good at picking up women. Despite giving consistently good performances, Jesse Eisenberg might be one of the more consistently crapped on actors in Hollywood. He is mainly accused of being a Michael Cera clone. That might be true, and I couldn’t help but see Cera during many scenes in The Double. Playing two different characters in one film can be a challenge, especially if the two separate characters aren’t all that different. Simon and Jesse look exactly the same, and sometimes they even act the same and take on each other’s personas, so the only way to really tell the difference between them is through subtle physical movements. James moves and talks with just slightly more confidence than Simon. The fact that he has to portray two different people, yet keep them somewhat the same, all in the span of just one scene, is fine acting if I have ever seen it. It’s not Tatiana Maslany in Orphan Black but hey, nobody’s perfect. Like in his first feature Submarine, Richard Ayoade directs The Double in a way that very few others could have directed it. He directs every shot and every scene with a special kind of care, like somebody who truly loves the craft. I think the best way to describe him is as a British Wes Anderson: every slow motion shot and musical montage somehow manages to be substance over style. 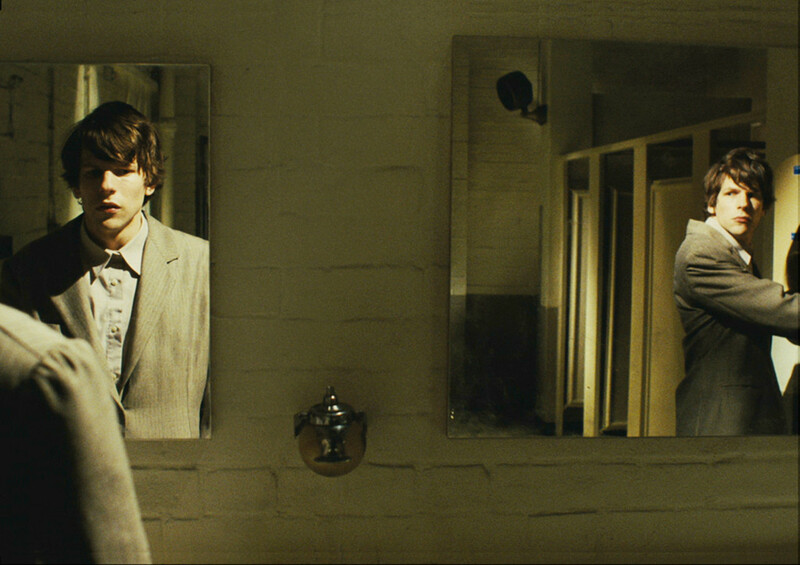 The Double is one of my favorite films so far this year, and I am not even sure if I fully get it. A second viewing might make clearer who is who and what is what. However, none of the humor nor pain are lost in translation on a first viewing. The Double captures the feeling of one of those days where you just feel like the schlimazel in the game of life. Richard Ayoade directs The Double like a love story, but not the kind of love story you would think it is. The Double presupposes that maybe before falling in love with the girl next door, you should first learn how to love yourself. But seriously, Tatiana Maslany is the greatest. Richard Ayoade has only directed two films and I can already spot the tropes. I actually find that kind of cool. For instance, both Submarine and The Double have montages that involve people chasing after fireworks because love. I love the interplay of shadows throughout the film. Both darkness and light frequently run very close to each other, just like with our two main characters. A great alternate title for this would have been Jesse Eisenberg and the Terrible, Horrible, No Good, Very Bad Day. I feel like most The Double takes place in Abed’s brain on a day where something went horribly wrong in the Dreamatorium. That or that episode of Broad City with Garol. I should probably stop watching so much TV.